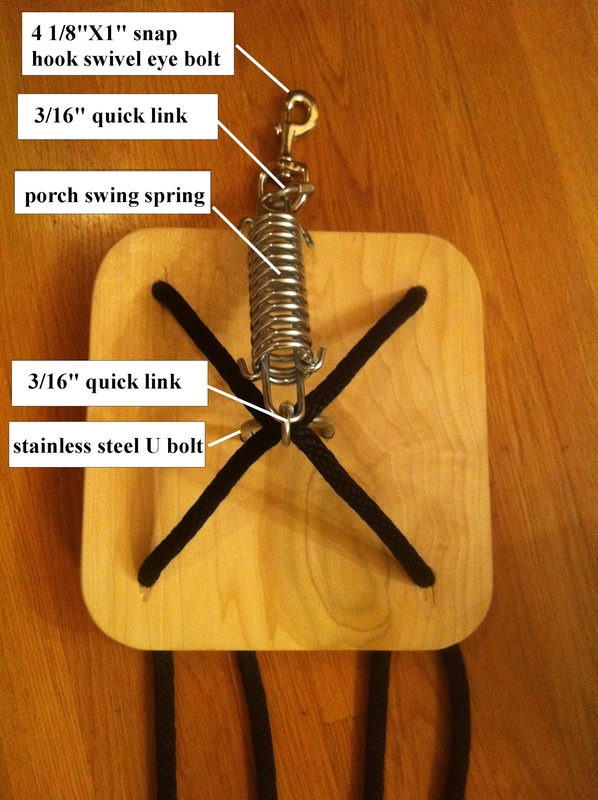 Loving a Miracle...: How do you make a platform swing? Becoming a special needs parent is challenging, & has a steep learning curve. I hope to give you a glimpse into my corner of the world, what I have learned, & what my life is like because I happen to love a miracle. 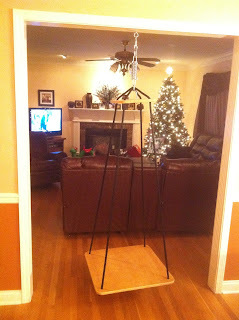 How do you make a platform swing? *Disclaimer: I am not a professional platform swing manufacturer. I have not done studies to prove this design is safe. I am NOT suggesting you build one, or use one. I am just telling you how I made mine. If you chose to make one yourself, I am not liable for any damages or injuries sustained. 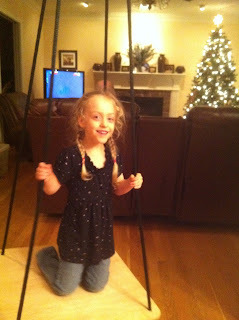 For those of you who innocently clicked on a link looking for nothing more than instructions on how I built my daughter's platform swing, you can skip the emotional story behind how I came to build a platform swing and start your reading at the first picture in this post. That it has taken me until March 12th to complete a blog post I started on December 26th is a pretty good indication of how busy and hectic my life has been. Sorry for the long delay. For some special needs parents, it starts with the all too early first signs of Christmas. Instead of the warm joy of the season, in the pit of their stomachs forms a knot of dread. They don't WANT to dread Christmas, in fact they feel guilty about feeling that way. These seemingly out of place feelings can add to a sense of alienation many of them feel year round. Years of practice comes to bear, and they plant a smile on their face. They try hard to feel the excitement of the season. They try not to let their thoughts linger in that space between was is and what should be. Like many special needs parents, I've spent enough sleepless nights grieving that distance to know that thinking about what could have been can be very seductive. Chasing "if only" around your brain at 3 am can be very tempting, and circular. It is a little like running on a treadmill, no matter how long or hard you run, you end up right where you started, just more tired. "If only" thinking is an alluring thief that can steal a lot of your precious time and energy, if you let it. You certainly don't need to have a special needs child in your life for the holidays to be difficult, but having a special needs child does tend to add a few more challenging elements to the mix. Aside from the usual family dynamics everyone has to navigate, there are also lots of judgement calls to make. Which, if any, invitations should you accept? Will your family/friend be understanding about your child's needs? Will they be offended if you decline, or have to leave too quickly? Just how do you tactfully say to someone that their house or event is just not well suited to your child's needs? Perhaps even worse, you may have already declined a few too many invitations, and your friends have moved on. I have decided that the trick to being able to enjoy the season is by starting out with truly realistic expectations, not just of your child, but of the family, friends and acquaintances you will interact with. Will someone get their feelings hurt when they discover that my nearly 5 year old daughter not only doesn't care to open their present, but also has no use for what they thoughtfully picked out? After all, what little girl doesn't like dolls?! Well mine, for one. I understand all too well the confusion and frustration that can create. Every year, it falls on my shoulders to figure out what gifts are going to be both enjoyed by her and financially feasible. That task is what brought me to the place that is the source of my own Christmas dread: The toy isle. This Christmas, after as much denial and procrastination as the calender would allow, there I stood. I had spent three days talking myself into going. I told myself over and over again that I could do it. This year I would shop for Morgan's gifts without crying. This year I would find something that would make my daughter's face light up with excitement. As simple as those goals may seem, I had never managed to do either one before. For those of you without developmentally delayed children, imagine for a moment what Christmas morning might feel like if your child had no interest in opening, much less playing with the things you bought. Would you feel like a failure? I certainly did, every year. This Christmas was going to be different. I was determined, desperate even, to find one thing that would make my daughter smile. I found myself standing in the toy isle, with my confidence crumbling. Toys clearly labeled for Morgan's chronological age screamed at me, painfully demonstrating how very far she is from developmentally ready for those toys. It seems most of them are meant for pretend play, which for Morgan is likely years away, if it comes at all. Her sensory issues make the dress up clothes seem more like torture devices than play things. The toys she MIGHT be ready for are brightly labeled for much younger children. It seems she already owns nearly everything that is both developmentally appropriate and remotely in our budget. Bumping into those kinds of inescapable facts is how the toy isle manages to bring up so many painful feelings. It can stir up the grief, fear and pain that sometimes comes with being a special needs parent. Everything we have lost comes into sharp focus. Buying gifts for your child is supposed to be fun, right? The lump in my throat told me I needed to walk away quickly, or risk embarrassing myself with the tears I knew would come next. I walked out of the store feeling defeated, no closer to knowing what on earth to buy for Morgan than when I started. I was glad I had come alone. I was frustrated and angry at myself for getting emotional again this year. I sat alone in the car and cried, proving once more that the best predictor of future behavior is past behavior. Morgan is almost 5 years old. I should I be past this by now, right? The answer is no. For special needs parents, the grief often comes in unpredictable waves over the years. After a quick poll of the other special needs parents I know, I have also discovered that crying in the toy isle is not nearly as uncommon as most people would think. Sadly, I am not alone in this struggle. Mercifully, inspiration finally came while I was observing one of Morgan's Occupational Therapy sessions. Morgan smiled & said, "I want SWING!" She puts a heavy emphasis on the "g," so it comes out "swin-gah." 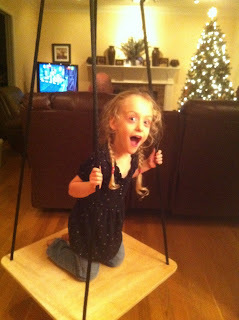 I looked at the platform swing & thought, "She would love to have one of those at home!" A quick Internet search later, I found that the platform swings listed in my price range didn't include everything I wanted. The descriptions were often hard to interpret, & left me unsure of exactly what I would be getting. Thanks to my procrastination, getting it to my house in time for Christmas was also questionable. Since I am pretty handy, it occurred to me I could just make one myself. I snapped a few pictures of how the one she was using during OT was constructed. One trip to the home improvement store (Home Depot) & I had everything I needed. To skip reading the details of how it was made, start reading again after the number 19 below. 1 3/4" 2X2 foot piece of plywood. Which was pre-sanded on one side. *Disclaimer: I am not a professional platform swing manufacturer. I have not done studies to prove this design is safe. I am NOT suggesting you build one, or use one. I am just telling you how I made mine. If you chose to make one, I am not liable for any damages or injuries sustained. 1.) I laid the 3/4 inch plywood on my work surface. 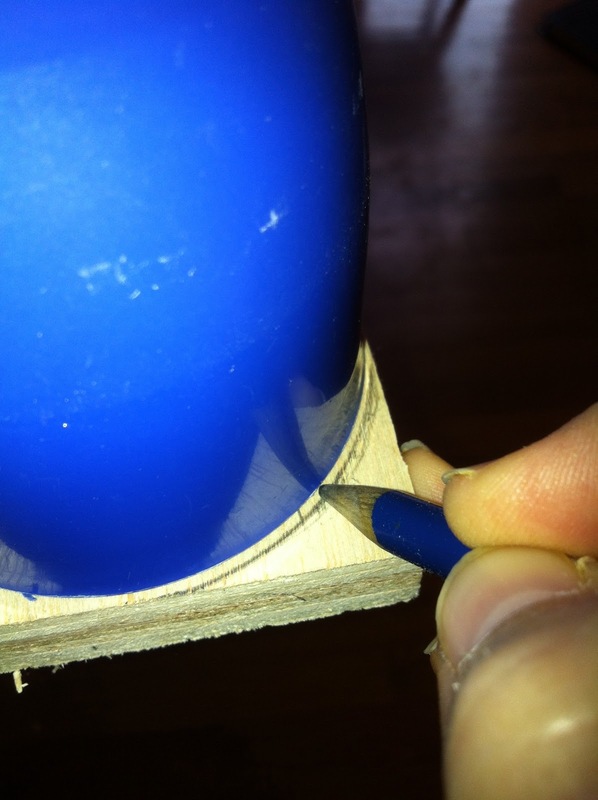 I used a glass as the pattern and marked with the pencil the wood I wanted to remove to make the corners of the plywood rounded. 2.) I measured and marked the layout for the holes the ropes would go through at 1 1/2 inches from the edge in each corner of both boards. 3.) I measured to find the center of the smaller board & marked the layout for where the U bolt would go. 4.) 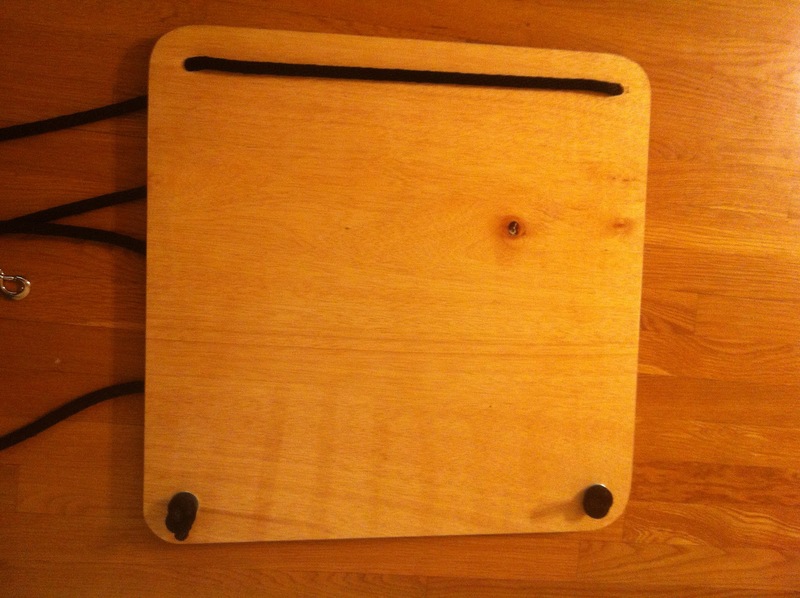 Using the c clamp(s) I secured the board to the work surface. 5.) Using the hack saw, I cut away the corners of the plywood, leaving the corners roughly rounded. 6.) 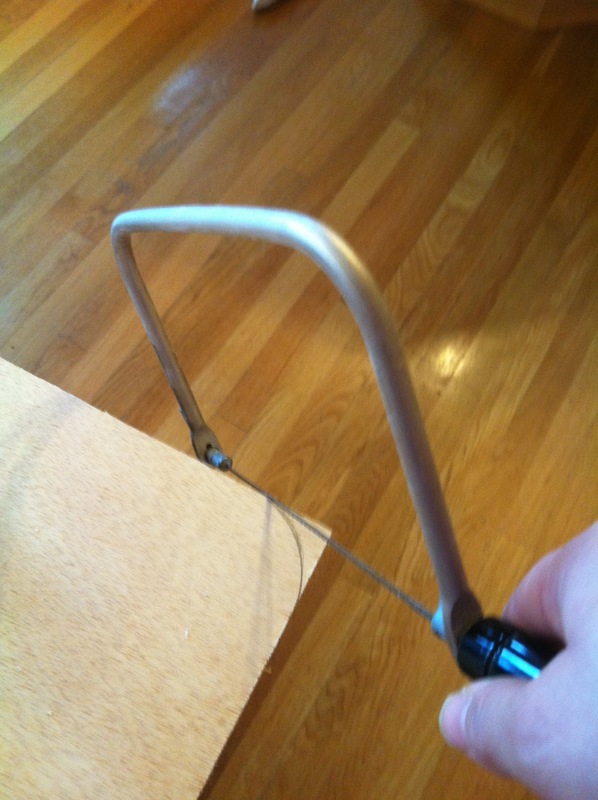 Making sure the board was still secured to the work surface with the c clamp(s). I used a 1/2 inch drill bit to drill the holes the ropes will go through on all four corners of both boards, and using a 5/16" drill bit I drilled the holes for the U bolt. 7.) 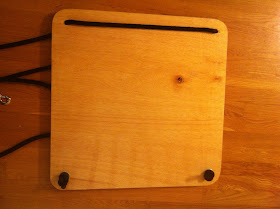 Using the coarse sand paper, I smoothed all the edges of the board, and the edges of the holes the ropes will go through. 8.) Using a fine finishing grit sand paper I sanded all surfaces of the boards. 9.) I wiped the boards down with a damp lint free rag to remove any saw dust. 10.) Using two dowel rods per board, I suspended the boards between two chair backs on the dowel rods, by placing the dowel rods through two adjacent holes which I had drilled. This allowed me to coat the entire board back and front at the same time, without waiting for the first side to dry. I followed the manufacturers instructions for the polyurethane, and applied 3 light coats of polyurethane on all surfaces of the boards. 11.) I allowed the boards to dry thoroughly. 12.) Once they were dry, I attached the U bolt to the center of the smaller board. 16.) I installed the 5/16"X4" stainless steel screw eye bolt. It MUST be installed into a substantial board, or it will come loose and risk injuring the user when the whole thing falls. 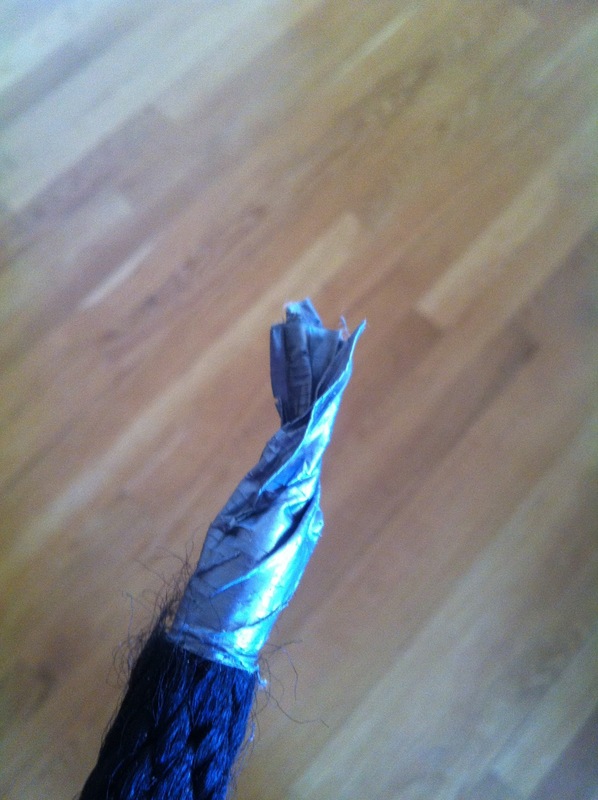 This is a potential risk in any hanging equipment. 17.) I hung the platform swing up and adjusted the rope so that the swing hung level, and about 8 inches off the floor. I ended up trimming about a foot off the rope to get it to the height I wanted off the floor. The exact length of rope one would need would vary depending on the distance from eye bolt to the floor. 18.) Being very careful not to burn myself, I took a lighter and burned the ends of the rope just enough to melt (and fuse) the ends together so they wouldn't unravel. 19.) When estimating the amount of weight the swing can safely handle, you have to go by the weakest link in the swing. Each piece of hardware should be rated for a specific weight. The weakest link is the maximum weight that should be allowed on the swing. When it was finished, I stood back and decided it didn't look half bad. Not including shopping and drying time, I think it took me about 4 hours & a little less than $100.00 US to complete it. 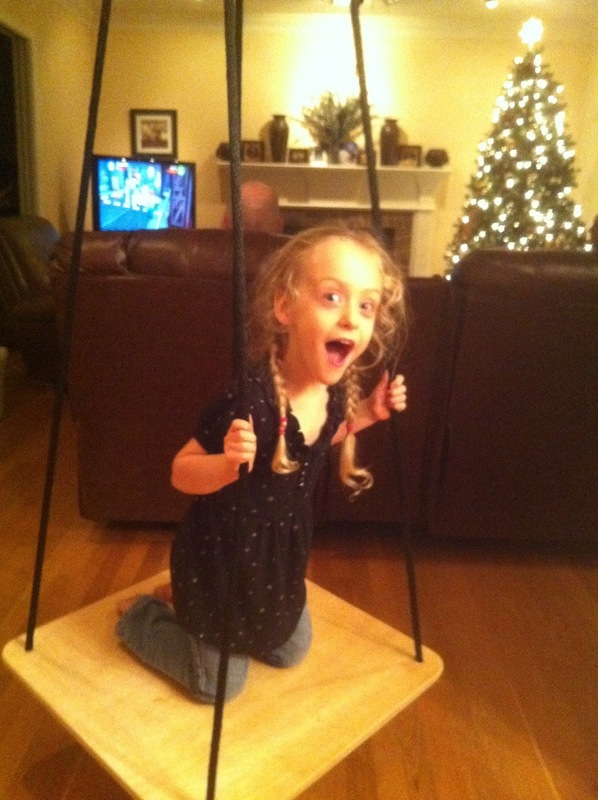 I sat on it just once to make sure it wouldn't come down easily, then said a little prayer that on Christmas morning, Morgan would be happy with her swing. Based on her reaction, I think I FINALLY got Christmas right. The smile on her face was hands down the best Christmas present I've ever gotten. I can not begin to tell you how happy that made me. "Loving a Miracle - Special Parents Supporting Each Other." This is the original support group, and all content is open to the general public. "Loving a Miracle - The Special Parent's Safe Zone." There is also a public PAGE. This is where I post information and links that I think are helpful to special needs parents. Permission to repost/reprint: If you would like to obtain permission to repost or reprint this post, please send me an email to kristinablizzard@yahoo.com. Thank you. LOVE IT. and wow, she's getting to be a big girl. and so beautiful. Anyway, great job. It's amazing and you clearly did Christmas right! Oh my goodness- this made me cry. Awesome job! Great post... I'm glad someone finally understands how challenging and hard Christmas can be. How much does morgan weigh and how is the swing holding up now? Does the swivel eye bolt allow for spinning or do you mainly use a forward to back or side to side motion? Thanks this was really helpful. Morgan weighs about 45 pounds now. The swing is holding up just fine. If you add a "snap hook swivel eye bolt" as pictured above, it will allow the swing to spin around. We hang it as pictured in a doorway, so we don't go too wild with the swinging. If you build one yourself, the most weight it could safely handle would depend on your selection of hardware. When selecting hardware, you should look at each of the hardware pieces and see what weight it is rated to handle safely. The weakest piece in the hardware is your top weight. With the pieces I chose, the weakest link is rated for 80 pounds, so my swing can safely hold 80 pounds. I imagine if I looked at rock climbing hardware I could find pieces that would be rated to hold adult weights. Just be sure to secure the swing from a substantial board overhead, to insure it doesn't come out. If I made it again today, I would probably find a thick piece of plastic to replace the board at the top, to make it lighter, and find some way of covering the hardware underneath the top board to protect the child should the unthinkable happen and the swing come loose from above. I happened to visit the site www.steelsparrow.com and found they supply quality Engineering products. I was searching for Eyebolts and found they have a good variety of Eyebolts and I got through www.steelsparrow.com. Their service is best and feel that this is a useful resource for companies like us instead of searching the entire market and wasting our time and energy. How do I hang a hammock swing from the house rafters? I am a registered nurse in the state of Kentucky. I worked as an ICU nurse prior to having my children. I have devoted my life to helping my children reach their full potential, whatever that means for them. I am very blessed to be the mother of two beautiful miracles. Our journey to parenthood was long, complicated, and painful, but very worth it in the end. My son, Logan, has High Functioning Autism, and ADHD. He is one of the greatest joys of my life. His current fascination is with Godzilla, and related creatures. My daughter was born 3 1/2 months early, weighted 1 pound and 13 ounces, and had a bilateral grade 4 intraventricular hemorrhage shortly after birth, which is just a fancy way to say "a really big brain bleed." We spent 4 very difficult months in the NICU. Classic autism, and ADHD are among her long list of issues. On paper, she looks a mess. In real life, she is an amazing force to be reckoned with, happy, healthy, and improving a little every day. I hope to share with you what life is like when you love a miracle, or in my case, two.